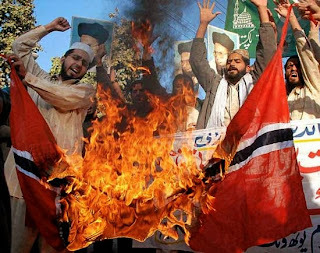 Jihadists in Norway. Jihadists in Spain. Jihadists in Great Britain. Jihadists in Denmark. Jihadists in France. Jihadists in Russia. Jihadists in Canada. Jihadists in the United States. Jihadists in Australia. Jihadists in China. Different countries. Different cultures. Different backgrounds. So why do they come to the exact same conclusions about what they're supposed to do? Reuters—Three men were accused in a Norwegian court on Tuesday of joining or aiding Islamic State in Syria, in the first case of its kind in the Nordics. Djibril Bashir and Valon Avdyli pleaded not guilty to participating in a terrorist organization, and Visar Avdyli denied providing aid to such a group - both offences under a new Norwegian law designed to crack down on returning militants. Authorities in Norway, Sweden, Denmark and Finland estimate that 300 to 400 people may have left for places like Iraq and Syria to receive militant training. Western powers fear radicalized fighters may come back to launch attacks at home. All three Norwegian nationals acknowledged traveling to join Islamic State, which has grabbed large parts of Syria and Iraq and, analysts fear, opened a new front in Libya. "Reintegrating" Islamic State jihadists and helping them find work and housing? Sounds like Denmark has copied a page from the "Obama Administration Official Handbook for Dealing with Global Jihad." We have to understand the mindset of those who understand and/or believe in divine revelation and prophecy (whether your opinion is that it is mental illness or faith it is still a mindset). religious and historical context; understand the mindset of Jihadists. "Partnership between America and Islam must be based on what Islam is, not what it isn't." number of reasons. The most notable being that they believe in the 'end times' (the last day and therefore (in textual and religious context) in wars of apocalypse. Wars of apocalypse, the end times, require two sides (it is the will of Allah). The mindset can derive an understanding that it doesn't matter which side they take, they are providing Allah with his will. will simply act as a kind of coded message declaring that 'together we will work toward the last day, the apocalypse, the wars of the end times. Ironic in truth. *Incidentally, this itself will excite the conspiracy theorists. b)we will do our part and they will do theirs, based on what Islam is. It is of course (the text makes it quite clear) a religion of conquest bent on seeing the 'last day'. interpretation of this statement by Islamic readers. Without abandoning Islam (according to it in text) and adopting a partnership with western ideology it can not mean anything else. Only shame in the light of Christ can stem their evil. David, where can I find out where and when yourself, Sam or Pastor Joseph are taking part in debates or talks that I can attend in my country (UK)?